The wait is over! 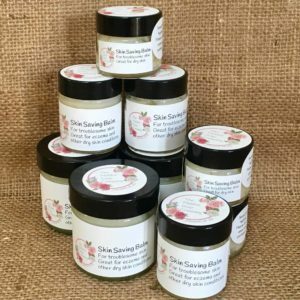 If you’ve been looking for a solid hair conditioner that is sls free, propylene glycol free, vegan, smells fabulous and, above all, works then look no further, your search is at an end! Organic cocoa and shea butter solid hair conditioner is every bit as gorgeous as it sounds. 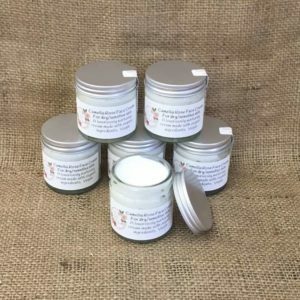 It’s made from a heavenly blend of waxes, organic oils and butters plus some carefully chosen hair beneficial ingredients to nourish and soften your hair without leaving it feeling gloopy. Why is organic cocoa and shea butter solid hair conditioner different? I’ve had to do quite a bit of research and experimenting (with some degree of disaster) to come up with this conditioner. 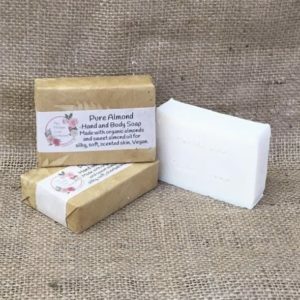 Other solid conditioner bars on the market are mainly made up of SLS (again), propylene glycol (petroleum based main ingredient of antifreeze), water and cocoa butter. Then the cocoa butter is mixed with stuff to make it water soluble and therefore not moisturising anymore – although it’s not as simple as just using cocoa and shea butters alone which would basically make your hair greasy and gloopy. I’ve now found the perfect combination of ingredients to condition the hair, soften and smooth, make it easy to brush through and smell incredible. 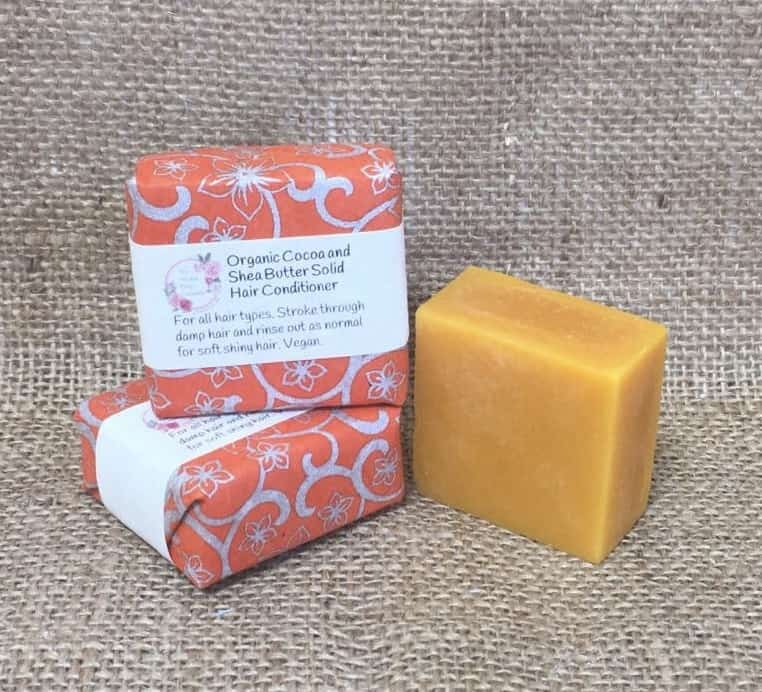 This bars vibrant orange colour and fragrance comes from orange wax, an incredibly concentrated gorgeous ingredient which means that no artificial colours need to be used. In order to make the conditioner slippery and actually condition the hair it needs to have certain other ingredients added, otherwise it would be just like a body moisturiser and wouldn’t penetrate the hair. What’s added to make it a hair conditioner? 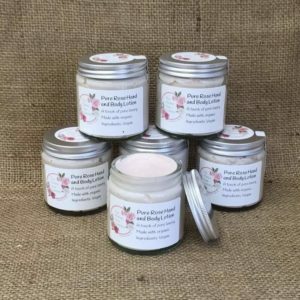 Organic cocoa butter: Brilliant hair softener, moisturiser and conditioner. Great for soothing sore scalps. 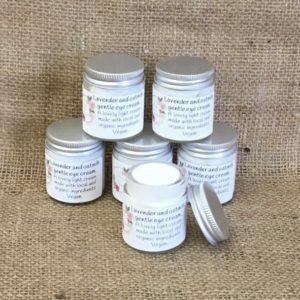 Organic shea butter: Gorgeously moisturising for skin, hair and everything else in between. Again, it’s great for scalp care. 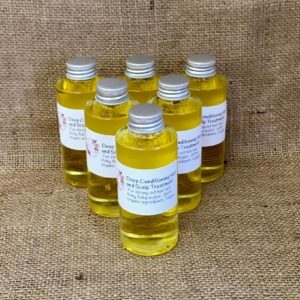 Vitamin E oil: restores lost moisture and is great for dry, damaged hair and skin. Plant Keratin: The keratin we produce naturally in our hair is an insoluble protective protein which is important for maintaining the hairs moisture balance and helps to keep it moist and supple. Its amino acids are a natural way to add these proteins to the hair to ensure it has a healthy appearance. Plant Keratin is a natural ingredient made from corn, wheat and soy proteins which, when blended together, mimic the proteins found in human hair, thereby penetrating the hair to moisturise and strengthen each Although it’s only a tiny amount, this product may not be gluten free due to the wheat content. Polyquertinum 7: is an organic compound which, when used in hair products, helps the hair to absorb moisture from the air and adds to the conditioning and soothing effects of the solid hair conditioner. Behentrimonium methosulfate: Sounds terribly scary but in fact it’s just a mild, vegetable based wax which is derived from rapeseed oil. It’s extracted using ammonium salt so doesn’t contained any alcohols which could dry your hair out. It gives the conditioner a wonderful slip and a powdery finish so the oils and butters don’t leave hair feeling oily and flat. Cetyl Alcohol: it’s not an alcohol it’s a thickening agent derived from coconut oil. Glycerine: A humectant which means it carries moisture into the hair so keeps it supple and hydrated. Panthenol: part of the vitamin B group panthenol has the ability to improve damaged hair. It increases hairs elasticity and moisture retention properties. Again it rinses out completely once it’s done its job. What’s so special about Organic Cocoa and Shea Butter Solid Hair Conditioner? It glides through your hair easily and doesn’t get bits falling off it like other solid conditioners can do. It leaves a layer of lovely moisturising butters and oils but doesn’t leave your hair feeling weighed down with product. It rinses out really well but enough product stays in your hair to actually make a difference. And it lasts for flippin ages (I’ve used mine every day for a month and have hardly made a dent in it even with using it all through my long hair) Other solid conditioners on the market go a bit soft and squidgy over time and eventually break up, even if you keep them dry. I cannot wait for you to try this brilliant little bar of loveliness! behentrimonium methosulfate, cetyl alcohol, organic fairly traded cocoa butter (theobroma cacao), organic fairly traded shea butter (butyrospermium parkii), polyquertinum, d panthenol, plant keratin pet, glycerine, vitamin E oil (tocopherol), ecosafe natural preservative (benzyl alcohol, dehydro acetic acid, sorbic acid and benzonic acid). I have been using this product for a week now & all I can say is it’s amazing ! I am converted to solid hair conditioner now! Not only does it smell totally gorgeous but it has left my hair silky soft & shiny . I love it. No nasty chemicals & no plastic packaging ,what’s not to love |? 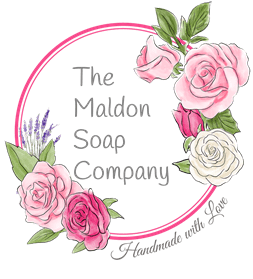 I’ve been waiting for someone to ‘invent’ a solid conditioner and wow Maldon Soap company have done it! It’s beautiful colour and smell are added extras and it really does the job of conditioning the hair after washing it with MS companies solid lavender and tea tree shampoo. I cannot express enough how much I love this product! It lasts for ages, at least three times the length of the shampoo bars so, although it seems a little expensive, it’s actually great value. It strokes through my waist length hair perfectly and takes away the slightly strange feeling your hair has when you use a proper solid shampoo (not those sls filled bars we have been led to believe are good for us). The combination is divine and I am a complete convert. Will never go back to the bottles of shampoo or conditioner again. I’m even taking this to the hair dresser so she can use it on me as I love how it makes my hair feel. I have nearly waist-length curly hair that tangles and dries out very easily – this conditioner has been a god send. My hair is the healthiest it’s been in a long time and much easier to comb through. My curls are very grateful, and the red in my hair seems to have come out more. Smells lovely too.Plus it is obviously so much better for the environment! Will never go back to liquid as long as this is around. OH MY DOG! This is just brilliant! I have just past shoulder length, fine but loads of it, gets matted-knotted just by looking at it type hair! This bar leaves my hair like silk! It’s so smooth and shiny and not even a hint of grease! I used to buy a cruelty free high end brand from my hairdresser – not any more this bar is for me! Please don’t stop making I share your quest to go plastic free! I’ll admit I was sceptical about using a solid conditioner bar (especially as I normally have rubbish straw like hair), but oh my days, how wrong was I?!? These bars are utter magic and last for ‘months’! A few strokes through your hair after using the solid shampoo bar (or survival soap) and it leaves my hair ‘completely’ tangle free, smooth, soft and light! I have no static when my hair is dry, it’s not flyaway and styles so easily. Unlike when I use chemical conditioners my hair doesn’t fall out when I use the bars – bonus!! I also get a wonderful, occasional gentle scent of orange throughout the day. It’s just amazing – a little bar of magic! This conditioner is simply amazing. After experimenting with disappointing solutions to give up big brand plastic bottled conditioner, this is IT! I love how it makes my hair feel. Totally blown away by this amazing little miracle bar, after washing with the rosemary and nettle soap bar I just run it over my hair and when rinsed off it’s so silky soft and smells wonderful. Even after drying throughout the day I can still smell orange. Wouldn’t be without it.